This week’s French Fridays with Dorie recipe, the Potato Chip Tortilla, is one that I actually did a couple of weeks ago for “Cook’s Choice”. This simple little tortilla was quick and tasty and I am looking forward to finding out how my fellow FFwD cooks liked it. In the meantime I am catching up with a recipe which the rest of the group did last December, Speculoos (called Spekulatius here in Germany). Speculoos or Spekulatius cookies are best described as cinnamon snaps, because they are similar to a ginger snap cookie, but with cinnamon as the primary spice. 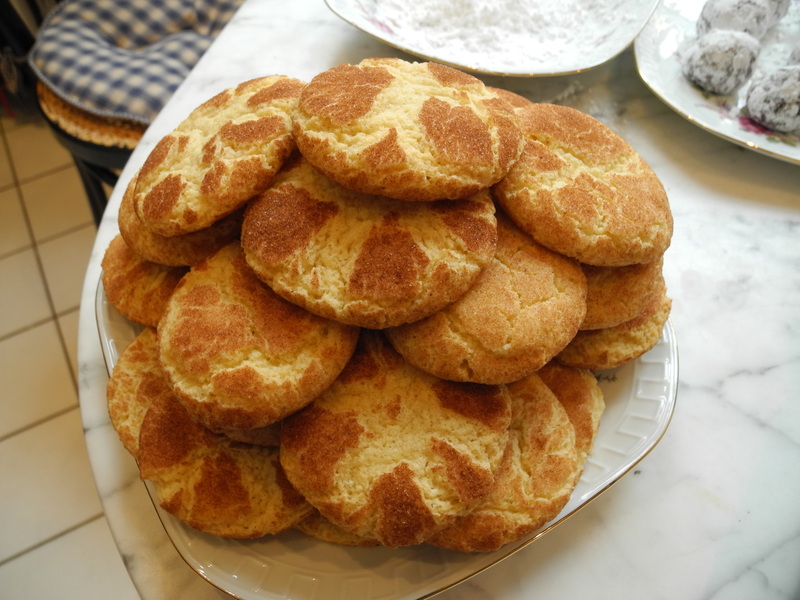 And, as I discovered earlier in the year when I tried to find some for the Cinnamon-Crunch Chicken recipe, spekulatius cookies are only available around Christmas time in Germany. So what better time of year to try my hand at homemade cookies? And, since it Tis the Season after all, why limit myself to just one cookie? I LOVE baking Christmas cookies. My family in the US always turns cookie baking into an event and I’m always sad to miss it those years when we can’t make it home for the holidays. Last year when I was in the US, we all met up at my aunt’s house and spent the afternoon mixing dough and baking batch after batch of cookies. My aunts bumped into one other in the kitchen as they competed to see whose cookies would win the most accolades. We cousins assured our aunts that ALL of their cookies were equally wonderful, and then whispered to our respective mothers that THEIR cookies were of course actually the best. The kids sat around the dining room table with overflowing bowls of colored frosting, decorating cookies and taste testing the results. Each year old favorites are mixed in with new experiments. Each year it’s one of my favorite days of the season. This year we are celebrating the holidays in Germany and that means that I am the primary cookie baker. So this past weekend my husband and I went to pick out a tree, invited over some friends to share the calories, and got to work in the kitchen. I chose Dorie’s Speculoos (recipe posted by Dorie on her website) and, one of my old favorites, Snickerdoodles. My husband picked two from Martha Stewart’s Cookies book, Chocolate Crackles and Brown Butter Toffee Blondies. For the speculoos cookies, I rolled them out to about a quarter-inch, and then shaved a minute off the baking time to ensure that I got chewy instead of crispy cookies. I know this isn’t how they are intended, but what can I say, in the great chewy versus crispy cookie debate, I have always fallen squarely into the chewy camp. I found the dough very easy to work with and my cookies held their shape pretty well in the oven. 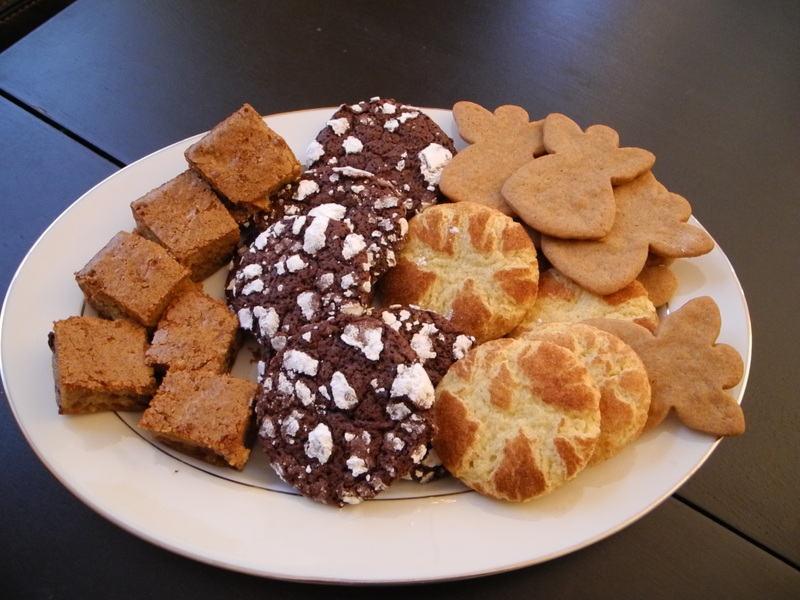 And, while all of our cookies were delicious, we agreed that the speculoos were the most Christmasy of the bunch. Partly because I used my Christmas cookie cutters, but also because of the lovely spice aroma which permeated our apartment while they were baking. Another winning recipe from Dorie! This entry was posted in french fridays with dorie and tagged Around my French Table, cookies, dessert. Bookmark the permalink. 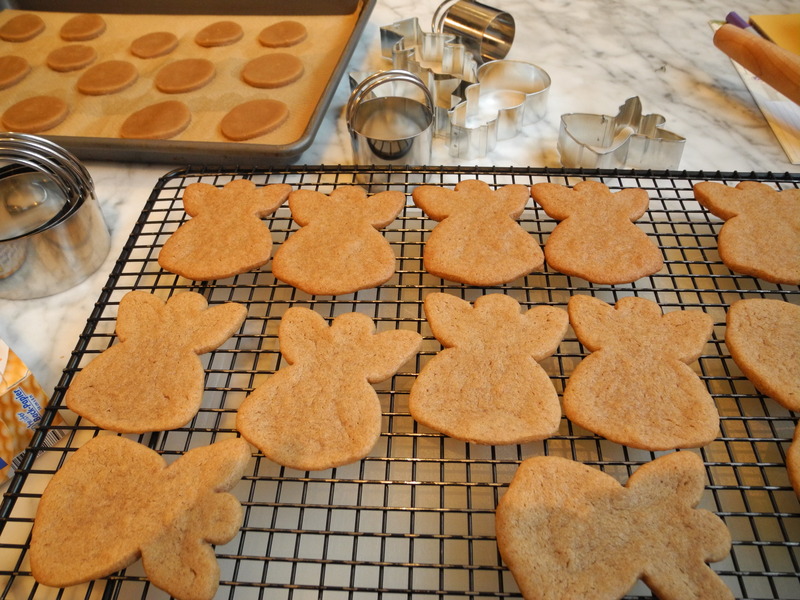 Your angel speculoos look like a marvelous addition to your cookie plate! Merry Christmas!!! Yaay…you finally went ahead and made the spekuloos cookies! Your angel-shaped ones look so beautiful and festive, in fact I wouldn’t mind helping myself to one (or more) of the lovely cookies on your platter! Have a wonderful and joyous Christmas to you and your family! Thanks you! I also made little christmas trees but they didn’t hold their shape as well in the oven. But they were still darn tasty! We made these speculoos last Christmas and I can still remember how wonderful the house smelled 🙂 Your cookies are so festive! I thought that was one of the best parts, they made my whole apartment smell like Christmas. Oh, what pretty speculoo angels 🙂 Sadly, I have never been able to get into cookie making for the holidays. I just gaze longingly at other people’s platters. Sad, isn’t it? Sorry you are so far from home this year for the holidays. Hugs. What a great idea! I’ve been wanting to make christmas cookies and you just convinced me to give this a go! Your cookies look soooo good!!! I just love your angel-shaped speculoos! They were so much fun to make last year and I need to see if I can squeeze baking some in the next few days. Cookie baking for Christmas is the absolute best part of the holiday. Your plate of cookies looks so inviting. I love your speculoos! They look so lovely especially the angels! I just made speculoos dough so that I can make these tomorrow! I love baking cookies for Christmas! Lovely looking cookie plate! Yum! Brown butter toffee blondies? Holy moly, I want to eat one NOW. And your speculoos look good, too. 🙂 That reminds me that I have some dough left in my freezer from back when I baked them. I may need to bake them off today. Mmmmm. The blondies were darn tasty. Your cookies are gorgeous! So sorry you’re away from home during the holidays, but at least Germany is very Christmasy. Tschuss und Froehliche Weinachten! Danke. And yes, it is very Christmasy here. I love the Christmas markets. Oh, those angel speculoos are precious! Your holiday cookies look and sound delicious. We don’t do many cookies in our house since it is just the two of us and Sasha the Wonder Dog. She’d devour your plate of cookies in no time. Happy Holidays! Gorgeous platter of cookies Rosa and I love the way you described your family’s cookie tradition. Cinnamon snap….why yes of course! I had a hard time explaining speculoos and you got it spot on. All of your cookies look delicious! Your cookies look great!!! 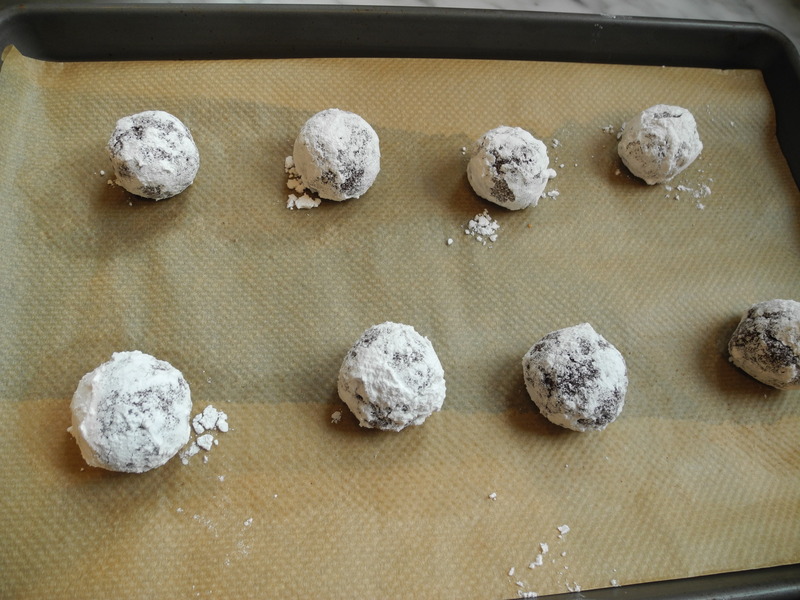 I was baking with my niece today – we made something like your chocolate cokies (cocoa snowflakes) one of my favorites. I was thinking that when I get a chance to bake some on my own (maybe this weekend) I would make the speculoos again. What great inspiration!!! Looks like you had a lot of fun! Your plate of cookies look great, Rosa. The speculoos are one of my favorite recipes in the book. I’m wondering if I’ll have to make some this week. I love your angel cookie cutter. I just bought a jar of speculoos butter, (at Trader Joe’s) which has the same cinnamon-y flavor. The jar says it’s from Holland. Have you seen it in Germany? It’s delicious on toast. I hope your Christmas season away from home is a merry one. Yum, that sounds delicious. I have not seen speculoos butter here, but maybe I need to look more closely. Glad you were able to catch up on this recipe. Your plateful of cookies looks fantastic! Your speculoos look terrific! Looks like a great Christmas. Enjoy!! Speculoos is available here around the year. ButI love to make them myself, or with my childeren. I didn’t see the recipe of the speculoos in Dories book yet, but I will try it out soon.